I had the pleasure of welcoming the Hardel family (Suzelle, Stephane and their teen daughters, Dilys and Maelle) of Normandy, France to Oregon for the Total Solar Eclipse (TSE). Having little interest in astronomy at the time, they were visiting Spain during the 1999 eclipse that went through France. 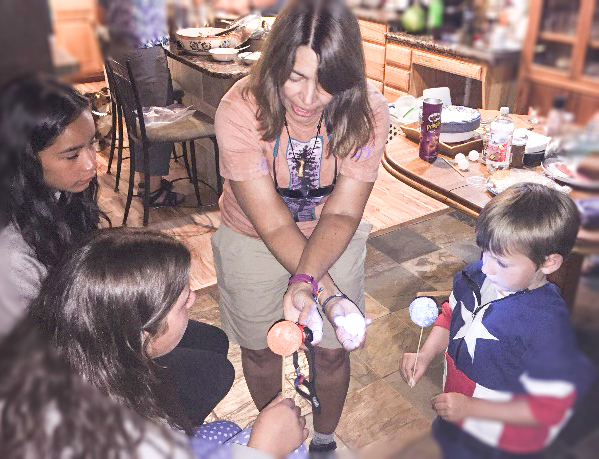 Like so many members of our club, Suzelle, a member of two Norman astronomy clubs, was lured into astronomy in 2007 when her long-time photography hobby blossomed into astrophotography. 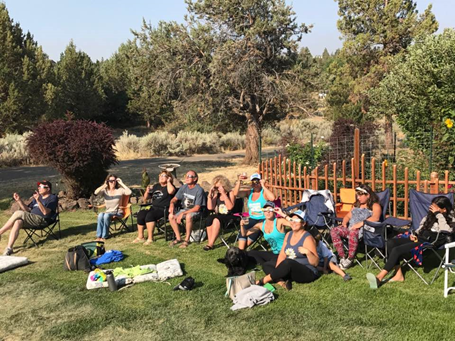 By March, when Suzelle was finally granted leave for an extended holiday to the USA, all accommodations along the Path of Totality from Oregon to Idaho were booked. So, she reached out to fellow astronomy clubs in both states asking for advice on accommodation. Having been unexpectedly shut out from OSP, I found myself in the same situation, i.e., all dressed up and nowhere to go. So I immediately extended her an invite to my little house in Portland, while warning her that there could be clouds west of the Cascades. As often happens when a single candle is lit – a large space is illuminated. Soon after my online introduction to Suzelle I put out a solicitation on Facebook for a spot anywhere in Eastern Oregon with the reciprocal promise of hosting a star party. I received an invitation to a large family property in Madras (from someone who was then an acquaintance). I shared my story of the Hardel’s with my Madras hosts and they extended the invite to the Hardel’s. What joy for both Suzelle and I! In the period between March and August multiple friendships were forged across Oregon and two continents! I learned that the Hardel’s and the Smith/Barrett’s share many of my values and interests. I also learned that the Hardel’s are building a small observatory on their property (located 30 minutes south of Caen, France with Bortle level 2 to 3 skies). 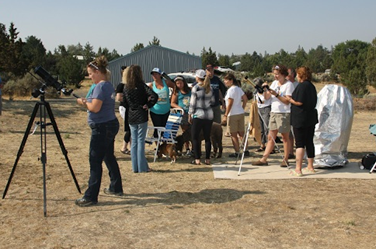 Folks age 5 to 87 gathered in chairs and on the observing field with 5, solar-filtered telescopes. I had an excellent time with the gracious Hardel family while offering them a Pacific Northwest experience of the Columbia Gorge, Portland Rose Garden, grocery stores, Lloyd Mall, Nike Outlet, and Portland neighborhoods where they sampled comic books, beef jerky, Ecliptic Brewery microbrews, Pacific oysters and salmon, meatloaf, hamburgers, donuts, and conveyor belt sushi. Dilys, who is 17 years old, was thrilled to find a box of Lucky Charms in RiteAid. In France she knew of them from YouTube. Lol! Concerns over pre-eclipse traffic delays deterred us from going on the usual day trips to the coast and mountains. After a few days we were off to Madras! I brought five telescopes with me to share the sun and night-time stars among 25 or so people. In Madras we shared delicious, communally-prepared, inter-cultural meals prepared by hosts and guests of four generations, and we sang French and American songs. Did I mention that none of the Hardels are fluent in English or that Suzelle and I were the only amateur astronomers at the 3-acre home of the Smith-Barrett families or that it hardly mattered? Every person in our group had a marvelous eclipse weekend that was synergized by so many open hearts among people who were once strangers. It goes to show that we are all one under the “SUN,” that the best things in life are free, and that food and music is a universal language. Suzelle and I are eager to forge a sister club between RCA and Astroclub de la Girafe and many of us wish to be in Spain together for the next European TSE. The next time an email comes your way from a stranger who shares your passion for the stars, light the candle, you won’t be sorry.